We’re more connected now than ever before. The graph above and these live stats about the internet prove that (check it out – it’s very cool). Social media has made it easy for us all to stay connected and in-the-loop with people we know, or used to know. Not only this, but it has allowed us to interact with people we have never met, at scale. It’s proved valuable too, social media marketers all over the world are exploiting this value. Great companies make the world smaller. They make resources more accessible whether that be information (Google), people (social media – FB, Twitter, LinkedIn), transport (Uber), accommodation (AirBnB), goods (EBay) and so on. I was fascinated whilst reading Tim Ferriss’ ‘The 4-Hour Work Week ‘ about the challenge he would set his students whilst teaching at Princeton University. He would offer a round the world plane ticket to the person who could connect with hardest to reach influencer/celebrity and ask them for the most interesting advice. What he found was that the majority of students gave up before they even started. Why? Because, in a class of 60 with only 1 plane ticket up for grabs there was bound to be someone who could do it better than them, right? They were afraid of failure. Yet the year after, Ferriss explained the task again, and explained the outcome from the year before and that then gave the students the belief that it WAS possible and hence the majority gave it a shot and were successful. Amazing what a change is belief can do. In fact, I decided to put this to the test myself last week. I recently read a book called Inbound Marketing by Brian Halligan and Dharmesh Shah, the founders of Hubspot. Hubspot is a marketing software company and went public last year (market cap of ~$1.3billion as I’m writing – this is a very respected company and Brian and Dharmesh are extremely well respected people). Dharmesh is also a very highly regarded startup mentor and angel investor having built his audience through his blog OnStartups. I asked a question on Quora about an inconsistency I spotted between their advice in the book, and what HubSpot were using in practice for one of their products. Just a few days later, Dharmesh himself took the time to respond to my question with a detailed answer. 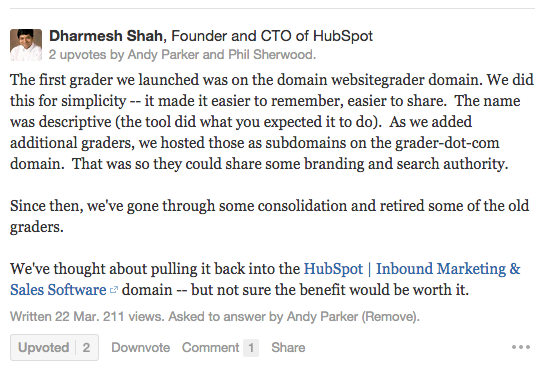 Dharmesh’s answer to my question – the content is not so much what’s important here; it’s the fact that I was able to connect and get an answer directly. How awesome. A small win, but a win none the less that could easily have been viewed as too hard, or ‘pointless’ to even try. Coming back to Tim Ferriss’ class at Princeton, believe it or not, one of them connected with Eric Schmidt, Executive Chairman of Google. This is all proof that networking is not just important, but so achievable – on a scale that most probably can’t imagine. It’s also proof that keeping in touch is no longer a challenge and I’m sure that’s something we’re all guilty of slipping up on. The world is small – let’s use that to our advantage. What examples do you have of the world being smaller than anticipated? Who have you connected with you might not have done otherwise? Who will you reach out to having read this post? Let me know your thoughts in the comments. Great article Andy – love your writing style. I love this sort of stuff, it drove me to get awesome speakers when I was running Southampton’s enterprise society. A member of staff gave a hitlist of potential speakers offering cash incentives for landing them, to the whole committee. Just like you said, nobody went for it, but I picked one of the bigger names on the list (founder of king of shaves) and got him to come and speak. It’s also very interesting from a biz dev perspective, a lot of salesman will shoot for the low hanging fruit when going from senior staff from CMO’s to heads of online can yield a much higher return. Just ordered 4 hour work week, will let you know my thoughts! That’s awesome about the speakers and your point about sales also completely makes sense. In general I think it comes back to the fact that *most* people are willing to help and if you have a compelling reason for them to engage with you then they’ll give you their time. 4HWW is a really good read. Completely opens your eyes to lifestyle design and the definition of ‘success’! Couldn’t agree more. As long as you make it personal and relevant, you’ll be surprised by the results.